I want all my work to be completed as fast as possible. But at the same time maintaining the security is also an issue. The Autorun virus and all the related malwares acts like a threat whenever we are using any USB device. If everytime I have to waste my time in scanning the devices and then wait to open it. That is the last thing I would like to do especially when I am in a hurry. But ofcourse the time can’t be the factor over the security of the system. So, what is to be considered and what is to be left. So, to handle a couple of issues simultaneously, I found BitDefender’s USB Immunizer as the very good alternative. 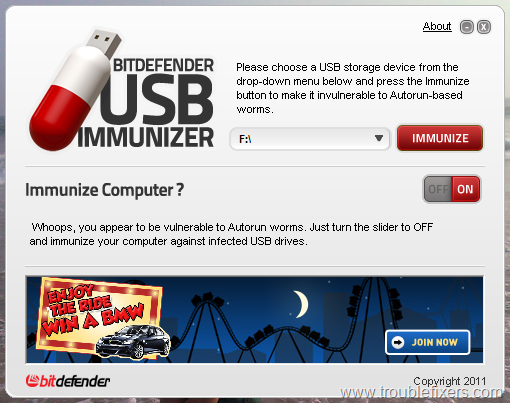 BitDefender’s USB Immunizer is a small freeware of 1.12 MB. It is portable utility and thus makes your work easier. With the series of wonderful security providers by BitDefender like the QuickScan for your Chrome, reveal the facebook Scams , this one inline will help you a lot. The user interface of the utility has been displayed in the snapshot below. Though the snapshot might have cleared a lot of your doubts just go through it to understand about the working of the application. Basically, the applications can serve the two purposes simultaneously. It can be used to immune both your system and the USB device. This can be done with the help of the upper and lower pane separately. Now, in case you have more than one USB device, select the one you want to protect. After that click on IMMUNIZER. In order to immunize more devices, you have to repeat the process for all the them separately. Apart from that you can also protect your computer. For that, use the option in the lower pane. And press the ON button to immunize the system. You can switch between on and of whenever you like. So, the utility will protect the system and USB devices from Autoron and the related viruses. You have to simply protect the particular device and the then feel free to use it. You have chosen the correct option for the protection from the bugs. Now, you can easily insert the USB device in any system because the autorun can’t create a problem anymore. Also, your system is safe to use all devices. The freeware has been tested in Windows 7 and will be compatible with all the other versions also.